Colourful hair. With your group, roll balls of colourful modeling dough. The balls will represent faces. You can, for example, have a green ball, a pink ball, a blue ball, a yellow ball, and so on. Make sure you have drinking straws in the corresponding colors. Let older children help you cut the drinking straws into several pieces. They will like the sound the straws make as they cut them. Deposit all the pieces on a large platter. Invite children to prick the pieces in the modeling dough ball of the same color to represent hair. 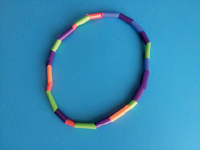 This is a great fine motor skills and color recognition exercise. Once all the straw pieces have been inserted in the balls of modeling dough, let children add eyes, a nose, a mouth, etc. to complete their silly characters. Raised letters. On a large paper banner, draw all the letters of the alphabet in a single row. Purchase drinking straws in bright colors and encourage children to cut them and glue them on the lines used to draw each letter. The effect will be quite pretty. 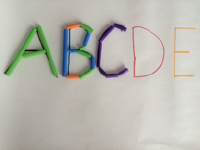 Furthermore, this activity will help children visually notice each letter. Use your banner whenever you sing the alphabet with your group. Point to each letter as you sing to help children identify and recognize them. Enclosures, fences, and roads. In your outdoor sandbox or indoor sand table, show children how they can stick drinking straws in the sand to represent enclosures and fences for plastic animal figurines or roads for toy cars and trucks. The best part: they can reinvent them over and over again. If you don't have access to a sandbox or sand table, or if you just want to offer something new, encourage children to arrange a series of drinking straws on the floor to represent enclosures, fences, and roads. You can set a few straws on the floor, forming two parallel lines. This will most likely suffice to motivate children to build an extensive network of roads on your daycare floor. Pickup straws. Deposit a large quantity of drinking straws on the floor, a few feet away from the children in your group who are standing on a line. Stand on the other side of the straws. Hold one straw of each color in your hands, behind your back. When you are ready, show children one straw and name its color. Children must quickly run to the pile of straws, find a straw of the corresponding color, and run back to the line where they can deposit the straw behind them. Continue until all the straws have been picked up. If you wish, you may give each child the chance to lead the game. Fine paintbrushes. For this painting activity, you will need a drinking straw corresponding to each color of poster paint you plan to make available to your group (a red straw for red paint, a blue straw for blue paint, etc.). Use sturdy straws. Pour the different paint colors in individual containers and insert a straw of the same color in each one. 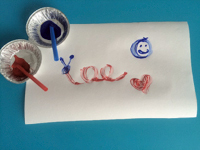 Invite children to use the straws to paint and draw on heavy paper. Utensil challenge. For each child, pour a small quantity of cereal with a hole in the centre (such as Cheerios) in a bowl containing approximately one inch of milk. Give each child a drinking straw and show them how they can insert it in the cereal pieces to pick them up one at a time. 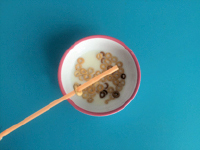 Encourage them to eat their cereal this way for a unique fine motor skills challenge that will put their patience to the test. Once they have eaten all their cereal, they can use their straw to drink the milk. Improvised necklace beads. Purchase several large drinking straws in a variety of bright colors. In big-box stores, you will find straws that are made for drinking thick smoothies. Their larger diameter will make this activity easier for little hands. Ask older children to help you cut them into pieces of different lengths. Once this is done, you can have your group sort them according to color. Provide colourful dental floss or plastic thread children can insert through the straw pieces to create unique necklaces they will be proud to wear. The smallest one wins. When you have to pick a child for a task or activity, use drinking straws to turn your selection process into a game. You will need several straws of the same color, at least one per child. Cut one straw to make it shorter than the others. The difference must be obvious. Hold all the straws in one hand, with the tips lined up (the shorter straw must be hidden in your hand). Children take turns pulling on a straw. The child who picks the shorter straw gets to perform the task or activity. 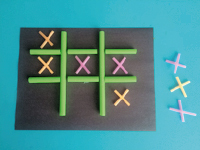 Homemade tic-tac-toe game. Glue four colourful straws on a piece of construction paper to represent a tic-tac-toe grid. You will also need four other straws (two of one color and two of another color). Cut each of these straws in five equal pieces. Use the pieces to create X's by criss-crossing them and gluing them together. Each player will have X's of a different color they can deposit in the squares of your tic-tac-toe grid. The first child who successfully places three X's in a row horizontally, vertically, or diagonally wins. Keeping score. When you play games with your group, it can sometimes be difficult to find a way to keep track of everyone's score. Before beginning a game, assign a specific straw color to each child or team. Deposit several straws of the corresponding colors on a table, next to a plastic glass or bucket. Each time a child or team earns a point, invite them to deposit a straw of the correct color in the glass or bucket. At the end of the game, simply count each child's (or team's) straws to determine who wins.